It isn’t often that Moliere is quoted on soup but should ever an occasion arise for the French playwright’s words to be appropriate I think the collection presented by Simon and Alison Holst in 100 Soup Recipes is the perfect match. It’s still cold enough to warrant soup and in this ‘everyday easy’ collection there is something for everyone – whether you’re a complete novice and want something quick and easy or are ready to experiment with a range of different ingredients. Lemongrass and Lime Leaf scented chicken soup was first on my list. Not necessarily because I chose to make this but I had never seen lime leaves at the local veggie store until recently and once having bought them I figured this was the perfect recipe to try. It’s a quick and easy soup and the only minor change I made to the process was to gently pound the lemongrass and lime leaves in my mortar and pestle (bruising the leaves and stems releases aromatic oils) and instead of canola oil, I used sesame. The recipe suggests chicken but it can also be made with fish and is an easy family pleaser that can be whipped up on a weeknight. There are more than a few chicken recipes including a Chunky Smoked Chicken Chowder, Granny Chicken Soup (which uses roasting fowl/hen and sherry) and a Moroccan Chickpea and Chicken soup. The latter I found could have done with a dash of paprika in addition to the cumin, coriander and turmeric spices but overall has a strong and appealing flavour that is lifted with the lemon juice and coriander. If you haven’t tried avocado soup it definitely worth trying though you may prefer it to cool instead of warm. However if you’re guilty of rushing around and your soup has become somewhat lukewarm or even cold by the time your guests arrive then you can’t really go wrong with the Gazpacho which is a fancy name for a soupy salad that brings together tomatoes, cucumbers and garlic (and sometimes peppers, carrots and celery) together to make a sunshiny addition to any meal. Two recipes are provided so there is no excuse not to at least try and play with making this very easy and flavoursome soup. 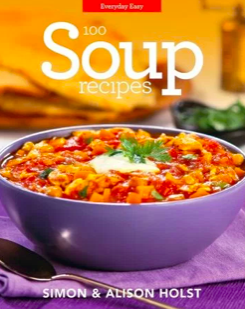 There is also an assortment of lentil soups including those with vegetables and sausages as well a number of bean soups, including Barley Broth, Black Bean and Rice, and Mediterranean Bean Soup. The collection has clear instructions and once you have the basic herbs and spices in your pantry there won’t be any problem feeding the family or your guests. It’s an easy and accessible cookbook – especially on those nights when the last thing you want to do is ‘think’ of what to do for dinner.